Didn't pre-order Kid Icarus: Uprising to get your free code for 3D Classics: Kid Icarus, and worried you've missed out on the downloadable game for good? Not to worry, as GameStop will sell redeem codes for the game online. Last week we reported GameStop is selling eShop games for download, and that range of two games will expand soon with the arrival of Pit's 3D classic. The game'll set you back $5.99 from GameStop when it goes on sale in the near future. I don't see why they're doing this, but okay. Is it un-buyable on the eShop or something? I hope Nintendo pushes buying downloadable games at stores further, but I think they should have waited awhile before putting this up for sale. I got my code by walking into a Gamestop and purchasing the code...I got my Kid Icarus uprising at Best Buy for $29 so with the code at $5.99, I saved....$3.99. I had no patience to wait for the game to be available in the e-shop so I'm super stoked to have the original game now. Eh, probably won't get it. I have, like, 30+ games for my 3DS right now, at least. And with KI:U, I'm not planning on getting a game until LM2 or AC3D. Or whatever E3 tells us about games. @SkywardLink98 why do you think they should have waited? I wish they do that at ebgames.ca but they don't. So I hope we get it on the eshop soon. hmm.. this is a great game. Tough difficultly, and it does look great with this remake (I was able to get it for free)....but I almost want to say I love playing it on the Wii better..it's a dollar cheaper, and it's on a big screen. But, it's really preference. The 3DS one has 3 save files along with better looks. @meltendo- WHAT!? only 29$ dollors at best buy!!! damn! i had enough to pre-order it!!! why!? why! whhhhhhyyyyyyy!!! I'm actually glad GameStop did something like this to be honest. I had got a download code for this game for $5.99 this past Saturday while I was attending a Street Fighter X Tekken tournament they were holding. 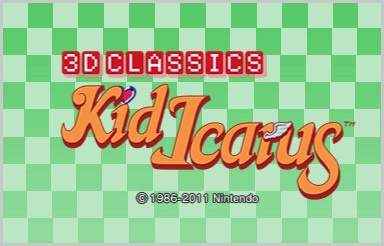 Makes me feel better knowing that I didn't reserve the game and also know that somehow along the road, there would be yet another way to get 3D Classics: Kid Icarus. Besides, it's not that I didn't want Kid Icarus: Uprising at all. It's just that I wanted to see what the reviews would turn out to be like before I plan on buying the game is all. @smashbrawler331 But you don't have to go to a store to buy it: you can buy it online or in-store. If anything that's a huge improvement on most download-only games! I preordered it at Best Buy.. but i have not received my code in my email account yet.. when will they send it? @smashbrawler331 You can transfer games across systems very easily... and not putting in another cartridge, in my opinion, is a massive positive. Imagine having to change cartridges for each GBA/NES game you want to play (Ambassador) on your 3DS; it's be incredibly tedious and annoying, and I simply wouldn't have touched half the games. Plus it makes giving stuff away free a lot more... free, for publishers/developers. I don't shop at Gamestop, unless I absolutely have to. Their used games market is destroying parts of the industry. I'm glad I'm the only one w/ enough brain cells to realize that's why a bunch of great games studios that make quality games are forced to down-size or close. Good job people! @shinobi88 Well, some of us peasants don't have enough money or time to buy and play every game when it comes out but it must be nice to be rich and have all the free time in the world like you do. I see where you're coming from on something like that. Back in the old days when I had a SEGA GENESIS and when GameStop was called FuncoLand. My mother had bought me Mortal Kombat II I believe it was for the GENESIS , used. The dam game wouldn't load right unless you had to practically jam it into the GENESIS while turning it on. Very annoying to me to be honest. That's why when ever I buy a game nowadays from GameStop , I always make sure that the game is NEW and not used. I just don't trust used games or used anything from GameStop , none what so ever at all. @Jumbif 3D Classics: Kid Icarus isn't available on the North American eShop yet so It looks like GameStop got itself an exclusivity agreement or something. @Smashbrawler I prefer download only. To buy it at a store is great. I don't want to buy download cards, I'm an impulsive shopper, and I always leave with buyer's remourse. With money however, I can limit myself and only bring the money needed to buy that game. I was assured by a Nintendo rep two months ago (yeah, lots of stuff can change in that time) that 3D Classics Kid Icarus would not be available in the eShop. I suppose that meant that it could still be sold elsewhere. Ah, well. KI:U was only $29.99 on Amazon preorder, too. I bought it for $39.99 and woke up to an email saying, "We're putting $10 back on your credit card due to our preorder price guarantee." Thus far, 3D Classics Kid Icarus is the best part of the deal. Three chapters in to Uprising, I'm not yet used to the controls. One thing that was different is that when you buy the download the pin number was on the recept rather then a special download card. I guess thats good for the enviornment, but bad in that you need to redeam it quickly since it doesn't take much to rub the ink from recepts off. I'll wait and see if it does appear on the eShop or not for a while, but it's at least nice to know that there is another way to get the game. I presume that I'd have to change my location to USA in order to download it though. I had to do that before when I bought some American 3DS points, all the games that I bought worked fine, the only thing was that I had to spend all the points or I would have lost them all when I switched my location back to Canada. Actually does anyone know if it's possible to change your location from North America to Europe, access that eShop, download games only available there and then switch it back to North America? I have no idea, but I doubt it. Otherwise, everyone would have all these games from different regions right now. @mushroomer Wow, that totally stinks. I pre-ordered it from Amazon and I got my download code the morning Kid Icarus: Uprising was released. When I pre-ordered it, they told me I would get the code within 1-2 days from when it was shipped. Ya man. dark-insanity is right on the whole region locked situation. Heck, even if you were to somehow switch your region to let's say Japan to download a game from their eShop like Wario Land: Super Mario Land 3 or Kirby's Dream Land 2 for example, then by the time you switch it back to North America, they probably wouldn't exist on your 3DS after all the trouble you went through to get the games. I know retail games are region locked but I wasn't sure about the eShop. So basically it is set so that you can only switch and download games from countries within your region. I've switched my location within my country a few times (when tax would have left me short to buy a game) and switched it to the USA to use the points that I had; but I thought it also gave me the option to switch to ones outside my region too which is what made me think of it. I didn't want to try myself though as I have quite a lot of cash on my 3DS at the moment. Seeing as how more than half of the 30 some games I've downloaded on the 3DS were free (including this one), I still have to say there's pros and cons with this setup. Pros: this method is good for players who don't want (or cannot) spend $20 on a card when they only want one game. It's also a good alternative to people who don't have a credit card to put on a predetermined amount. Cons: If a store is selling a DLC code, there can be a small chance the code doesn't work (this has happened to me at least once). There's also the chance that the store may charge more for the code than the company running the handheld would charge for the game. Interpret what you will; I say this game is well worth its purchase. Awesome to have the backgrounds give a whole new meaning to parallax scrolling... Very cool..